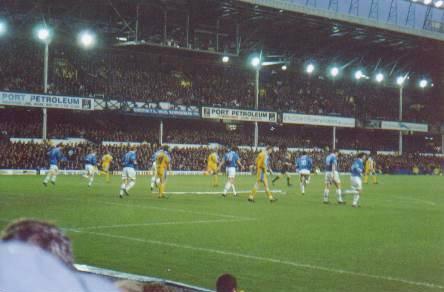 This page has pics I took at league matches at Goodison. GP is my favourite place in the universe - such a shame about the crud that's played there over the last few years. The first of two 2-0 losses to Man Utd, this one was at my second home on 27 August 1997. Still 0-0 at this stage, before that little turd Sheringham scored at the Park end. A rare win in 1997-98, over Chelsea in January in the last match before I left England for ten months. It was a really good send-off for me personally, and a game that was actually enjoyable to watch. And yes, that is Slaven Bilic on a football pitch, next to Flo under the Port Petroleum sign. Hmmm. 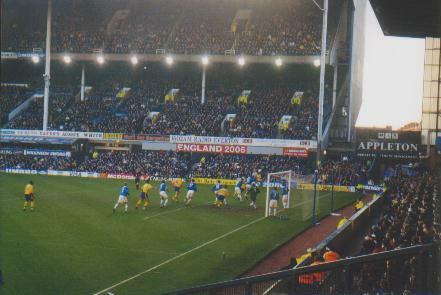 Another boring 0-0 draw, this time against Leicester in January 1999. I went with the rest of the family to this one, instead of on the Wakefield Blues coach.